It used for military operations, is a thickening/gelling agent generally mixed with gasoline or other fuel. This term comes from the ingredients of aluminum salts of naphthenic and palmitic acids. This style of napalm, however, has been long obsolete in warfare. “Napalm b” is the modern version of napalm although it is distinctly different from the previous form. Napalm is often used as the generic name of several flammable liquids used in warfare. These are often forms of jellied gasoline that is expelled by flamethrowers in infantry and armored warfare. NapalmB is a mixture of plastic polystyrene and hydrocarbone benzene. It is used as thickening agent to make jellied gasoline. The ignition of NapalmB is easy to control and provided a great advantage to the soldiers, airmen, and sailors that used it. The more modern napalm is composed primarily of benzene and polystyrene. Since the mixture is difficult to ignite a reliable pyrotechnic initiator must be used such as thermite or white phosphorus. NapalmB can burn up to 10 minutes while the old one only burned for 15 to 30 seconds. In order to increase the deadliness of its predecessors Americans and Allied forces used Napalm 877. This substance is supposed to adhere to surfaces and is created by mixing NapalmB with gasoline in various proportions. 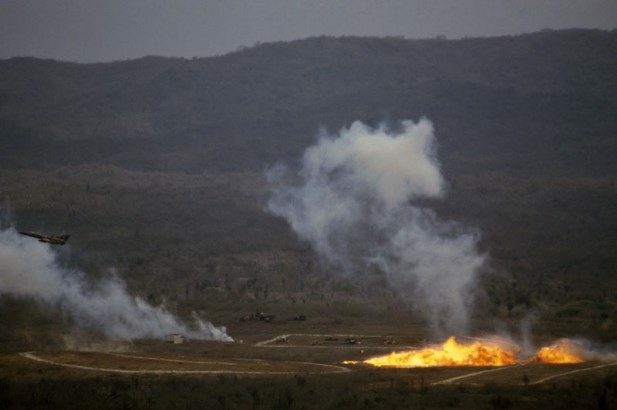 Aside from the heat and flames, Napalm also deoxygenates the available air very quickly while also producing large amounts of carbon monoxide. Greek fire which is similar to napalm was one of the first known uses of fire in warfare. Predating napalm was jellied gasoline mixtures that were used by Allied forces during World War II. Previous devices used latex; however, since natural rubber was almost impossible to obtain during the second World War a different product had to be developed. This need forced the development of synthetic rubber and lead to Louis Fieser creating synthetic napalm in 1942. The Dow Chemical Company manufactured napalmB for the American armed forces although they experienced some boycotts due to napalmB’s ability to disfigure people. However, they did continue to produce it and eventually it became a symbol against the Vietnam War. When used as a weapon Napalm can cause severe burns to the skin and body, asphyxiation, unconsciousness, death, and an atmosphere of greater than 20% carbon monoxide as well as self-perpetuating windstorms of up to 70 miles per hour. This is all made effective since Napalm sticks to naked skin and is hard to remove. One firebomb released from a plane can cause damage over an area of 2,500 square yards. It was used in flamethrowers before it became prevalent in firebombs. Napalm bombs burned out 40% of the area of Japanese target cities in World War II. The first of the napalm bombs was dropped on July 17, 1944, by 14 American P-38 lightning aircraft. NapalmB has been used in many wars including the Greek Civil War, the Korean War, and the Vietnam War. Kim Phúc, a napalm survivor, says it is the most terrible pain you can imagine. Napalm can generate temperatures of 1,500 to 2,200 degrees Fahrenheit. Water boils at 212 degrees Fahrenheit. Phúc, having sustained third-degree burns to half her body, was not expected to live. However, South Vietnamese and American doctors performed 17 operations and eventually he was returned to health. In 1980, Napalm was banned for use against civilian populations by the United Nations Convention of Certain Conventional Weapons.